Hello dear friends. I have another giveaway to share to you and I hope you will find time to join. Good luck to us all! My Little Legs Giveaway Nita's Corner is hosting this awesome giveaway on behalf of My Little Legs. from October 30 at 12:01am(EST) and ends on November 15 at 12:01am (EST). This giveaway is open to US residents only. Joining is fun and easy. Just fill out the Rafflecopter form below! Goodluck! Lucky winner have to respond within 48 hours, or I will have Rafflecopter pick another winner. Nita's Corner is not responsible for the delivery of the giveaway item. My Little Legs is sponsoring this giveaway and is therefore the person liable for delivery. Some tasks at home look deceiving! There are times we thought it is easy to do but, it ends up time consuming. Cutting apples is tricky and we don't want it especially when we are in a hurry for work. I love eating apples but sometimes it is inconvenient to prepare. I prefer berries and grapes because I don't have to do anything but rinse them thoroughly. With apples, I need to cut them in slices but, I am too lazy to do all that especially when I am in a hurry. But, look what I found! I saw this kitchen lil helper at IKEA Home Store and it is very affordable. Every mom should have this for prep convenience. It is easy and safe to use. The apple cuts are perfect, clean and most of all, quick! I told my mom that I will buy one for her too. I only bought this for less than $5. I did check online and some prices are way up to $30. Cutting apples in seconds is totally convenient! The middle part is separated when you use this tool so; nothing to trim after. There is no mess at all. Check it out in IKEA. Make sure that when you visit the fruit section, you pick the medium size apples. I bought an extra-large apple one time and it doesn't fit (*o*). If you love gigantic apples, you need a larger apple cutter. In IKEA, I only saw a one size apple cutter but, this tool is all you need really. Well, after seeing this kitchen tool, would you rather use a knife to cut apples or spend $5 bucks? The next time you visit IKEA, get this apple cutter and thank me later. Thanks for stopping by. 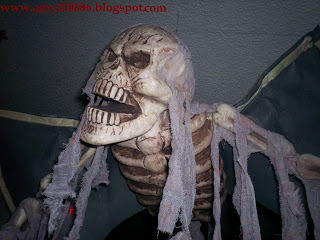 Here are some Halloween Decors that might scare you away. 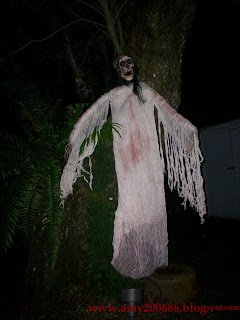 One Halloween party that we went to was truly awesome because from the front yard to the poolside was really scary. The ghosts are everywhere then, inside the house are full of scary stuff like mummies, bats, skulls and some skeletons screaming. When the guests arrived in full costumes, wow ... it was exciting! The poolside was transformed into a graveyard and a hanging skeleton on the treetops. They really spent thousands for Halloween Celebration. 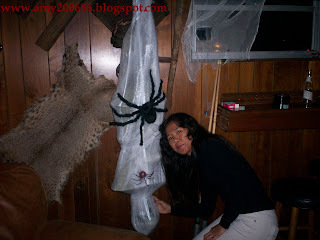 This is me beside the mummy. I do not know if this was battery operated. Everywhere we go, something will move and speak. Hubby took the picture and I am gone hehehe. Here is the spooky ghosts on the tree by the poolside. Some decors out there are battery operated so; if guests are not careful, they will be jumping on the pool to run away LOL. Even the graveyard will move. This skeleton is super cute. It will scream " LET ME OUTTA HERE". Some of the sound effects in the house are dragging chains and screaming for help. It was almost like they were on your ears. Sppoky and dark house but, fun LOL. This skeleton was hanging on the ceiling. Here are the bats with super red eyes. Nothing fancy but, since it was dark inside, you can see their red eyes and red fangs. A friend who like me are curious what these decors are up to LOL. 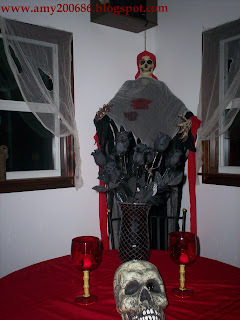 I just have the camera flash but, the house was set with dim lights, just enough to set the mood for Halloween. Oh, they got good foods too. Real food without the head and creepy spiders on the table. You all have a fun Halloween this year. Thanks for stopping by! 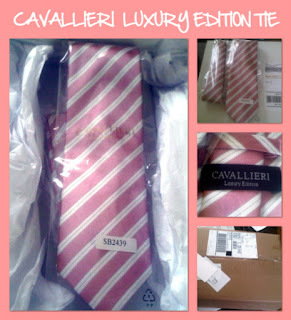 Few weeks ago, I received a lovely white colored parcel from Bows-N-Ties.com. I was very pleased that it came by the mail in less than a week after sending my request letter. Two important points that I love about this company: fast shipping and elegant style of packaging. If you order a product in this company and you send it to someone as a gift, you will feel confident because they will wrap the item so perfect. The item above is Rose Petal Striped Tie which is a combination of rose petal pink and ivory, a good blend of colors isn’t it? It is made of fine silk fabric and each stripe is hand woven. This tie is quality made and I also checked the seams which are just perfect. My husband and I are impressed considering this tie cost only $24.90 in the Website but, the quality of the product is incontestable. Would I recommend this item? Absolutely! If you want to order now, please use the code TR239YU and you will get a 20% off upon check out. For more information about this company, visit the link above and please follow this company in Facebook and Twitter for new updates on their products. If you have a problem with the code, please don't hesitate to call them at 866-927-6065 during office hours from 9:00 AM to 5:00 PM , Mondays to Fridays. Few months ago, when hubby and I were house hunting, we saw some properties with beautiful backyard but, the houses were in bad shape. We also saw the opposite; the house was livable but, the backyard was terrible. There were properties that the last owner gutted the entire kitchen cabinet and took with them the kitchen appliances. There was one property that I like though because it has a swimming pool with a good size playground. The property was fenced in and the front yard has the curb appeal. There was rundown patio furniture left at the backyard but, when I came closer to look at it. The fabric was bad yet, the body of the furniture was alright. I bet the outdoor furniture repair guy can splurge it. It looks like an expensive piece of furniture back when it was new and was taken for granted outdoor. For sure, Patio Guys can and will do the trick of making any rundown furniture into a beautiful piece for the patio and pool areas. Click the link above and check out the illustration on that page. The rundown furniture looks amazing after they sandblast the chair; repaired and repainted then, added new glides as well as new straps. Their skills are a blessing isn't it? I remember when my granny had a rocking chair handed from her generation and she kept it for years. She handed it down to my aunt and since it was rundown and some parts are missing, she eventually hired someone to fix it but, keep the look of its antiquity. It looks amazing! It is good to know that a company such as Patioguys.com has the skills to rescue a rundown furniture and preserved its' value. This particular company employs highly trained team of patio furniture refinishing experts. They can take out damage and worn out furniture. If there is faded and mismatched patio furniture, they have the skills to jive it all so; it will compliment in the whole area. They will refinish each item to look amazing and when you needed a patio chair repair guy, call them today. Do you believe in the premise that “A good working environment will yield to success?” Working environment involves the physical attributes and the people in it including the boss and the employees. I was already working when I was in College. I remember so well that I love to stay late in my workplace. I remember vividly the smell of books, the peaceful ambiance of the reading area where the hardwood tables and chairs were arranged between the series of shelves of books. I love to work every day. There is no dull moment in my workplace because all my co-workers get along well and all our bosses were very nice, kind and generous. All of us built a harmonious relationship so; the service we provide was great. Every month, there is always an exciting announcement in the bulletin board and all of us will help out in decorating, re-arranging the furniture’s and setting up accessories. It makes the whole place vibrant and beautiful to hang out. Anyway, the last company that I work with was quite the opposite. Our office has the best décor display in each corner in the premises with high end furniture’s and sitting area where guests and costumers can enjoy lounging with free beverage and entertainment. The company pays well and my bosses were phenomenal. The working environment was super negative that our boss had report to the head office almost frequently. Some of my co-workers deliver a terrible service and when it was time to go, they were out 5 minutes earlier. That was terrible huh? I lasted a year and I quit. Well, how about you? I just hope that you are working in a comfortable and harmonious working environment. If your company needed some office furniture suppliers, you can check out and recommend Aston and James Office Supplies Website. They offer great prices for all your office needs. Visit the site today. We just got back from a week-long road trip to 6 different states in the country. We were heading to the Midwest. We love the trip even though it was tiring but, it was worth the fun and excitement. The scenery was fantastic and the grandeur of the fabulous mountains was fascinating to see. We appreciate the beauty of nature as we travel in the farmlands, along the river banks and at the foot of the mountains. One of the impressive accounts that I won’t forget was when we saw a log cabin and log house in the middle of the farmlands. Wow! I wonder how it is like to live in that type of building. I never had the chance to spend a night in a log house. I have seen that in movies and yep, I did dream about living in it someday or just spend one night as a guest in a log house. Actually, there is place in South Carolina that reflects a charming community in a beautiful landscape with houses made of Timber craft. Hubby and I should schedule a road trip to South Eastern part of the US. I want to see their type of houses too. There are new homes for sale greenville in Rosewood Communities namely: Greystone Cottages, The Woodlands at Walnut Cove, The Gardens at Rose Reserve, Woodstobe Cottages, and Blue Stone Cottages. These communities have all the amenities that a family could wish for in a neighborhood. Children loves the playground and park so; they have Natural Park with beautiful landscape. Each community has its own unique amenities such as having a pavement walking trails that would end in the lake or if a family wanted to live by shopping malls then; they can have that preference. The good thing is that, Rosewood Communities have that kind of neighborhood. If you check the Website today, you will be blown away as to how affordable these beautiful cottage and timbercraft houses are. I love the neighborhood, the design style of their houses, and most of all, the price is truly awesome. How I wish I can buy a house in Rosewood Community. Last week, my husband and I traveled from Florida to Missouri. It was an interesting road trip since in 8 days we crossed Georgia, Tennessee, Kentucky, Illinois, and Missouri as far as Kansas City, Missouri. We had a flight schedule by Delta Airlines but, the day before the flight, my husband decided to have a road trip instead so; we cancelled our flight. Thanks to beautiful Anne- a good friend who did all the effort for the cancellation and refund process.We love you dearly Anne(^o^). In a separate post, I will share our road trip but, let me show you these photos taken at Main Street USA in Marceline, Missouri. When I first arrived in the US, I was blown away with Disney World. I have lived halfway around the globe all my life so; seeing Disney World is a privilege and I thank God for that. I never imagine in my wildest dream that I will be able to visit Disney World. In reality, this privilege is more than a dream come true since we live just half an hour away from Disney World. To see Marceline, Missouri is a bonus! This is the boyhood hometown of one of the most famous people on earth,Walt Disney. I have a picture of Main Street USA in Disney's Magic Kingdom but, when I saw the street sign Main Street USA in Marceline, it resembles the name and the charm of Main Street USA theme in Magic Kingdom. Disney family lived in Marceline for only four years but, Disney's love for his boyhood town is incontestable. The town provided inspiration for Disney’s 1955 animated film “Lady and the Tramp”. Watch it again and take note of the little details. Even though there are a lot of stories and speculations about Marceline Missouri, I fully believe that this town influenced Walt Disney a lot. His vision for Disney theme parks came from remembering his childhood memories and this particular place is one of them. Have you ever wondered why Disney animated films and even in the theme parks featured Choo-Choo train and railroads? I did wonder and it dawned on me when I saw the many train collections in the old Santa Fe museum now called Walt Disney Hometown Museum. The museum housed the effects, artifacts, and personal belongings of Disney family. With that being said, Walt Disney loves to ride the rails and he has this lifelong devotion to the railroad. “All Aboard!” Sounds familiar right? Walt Disney minds was truly creative. His vision was extra-ordinary! His dreams are big! If you look at this town and his perception of a happy place is just so deep and beyond what we actually see. Main Street, U.S.A. at Disneyland is based on the “turn-of-the-20th-century” downtown Marceline. There is no doubt that Walt Disney loves his boyhood town Marceline in fact; Marceline's Confectionery in Downtown Disney in Disneyland is named after this town. Honestly, I love this town because it is charming and the people are very friendly. No wonder why Walt Disney fell in love with Marceline. Some companies and investors in the Chemical Industry needed a chemical investment bank. That is the reason why The Valence Group came into existence. They actually offer the M&A advisory services. This company has developed a wide range of what they call a transactional experience and to name a few: sell-side, buy-side and joint venture as well as management buy-outs and fairness of opinions. I read in a science magazine which I pick up from an engineering firm that I visited about chemical mergers and acquisitions of certain chemical industry. It was about the innovative approach of certain companies heading to a more productive business. The subject of the article might be vague for me but, I truly understand how important the chemical industry is. The chemical industry comprises the companies that produce industrial chemicals and are vital to the modern world economy. Imagine the conversion of raw materials such as minerals, oil, natural gas, air, and water into different products and there are thousands of them. The Valence Group is one company that is qualified to advise on this subject with regards to Environmental Liabilities, Operational Carve-outs, Ongoing Supply Agreements, Off-Take Agreements and Site Operating Agreement and more. If you want to know more if this company has the expertise on chemical advisory, please visit their Website today. Boo! What's up guys? 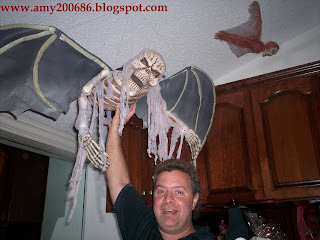 Looking for some Halloween decors? This house had cool Halloween decors in the neighborhood. 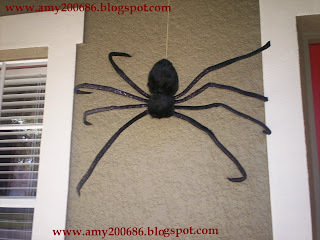 This is easy to create when you have Cobwebs, skeleton, black fabric and you are done! Here is the giant tarantula. Actually, this spider has a sensor. 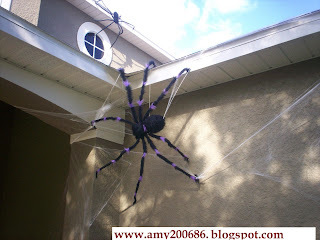 When kids were at the door knocking for some treats, the spider will jump at them hehehe. Here is another photo which I took from somebody's house. 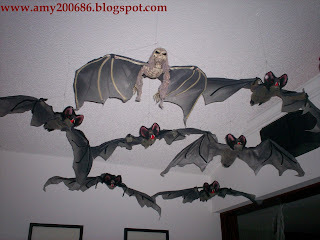 These bats are Halloween decors inside the house. This skeleton is scary. I remember that it will move when you stay close to him. Here is another cool decor. It has a sensor so; it will speak and move when you are nearby. He was checking on some cool decors. 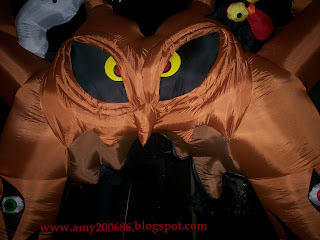 A giant inflated owl and all guests will go inside the mouth as a passageway to the main door. 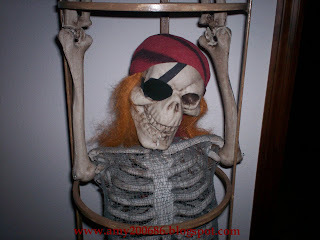 Here's another scary skeleton and this is freaky. 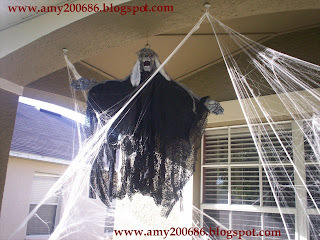 I told my hubby that we will decorate the yard but with white ghosts only. I don't like to see a skeleton or cemetery. I have the materials and idea on how to decorate the yard. How about you? 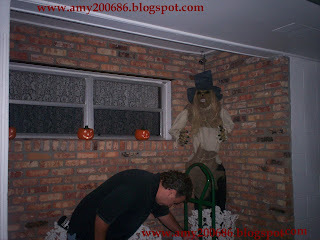 I hope that these photos give you an idea on how to decorate your place on Halloween. Enjoy! I do not have the time to go to the gym so; I shop on Wii fitness video on line. I found 3 Wii Games on sale for $19 and one of the games that I chose is the Jillian Michael’s Fitness Ultimatum 2009. I ordered and got it two weeks ago but, have not started my workout yet. My fitness goal would be to get back my flat stomach and workout for strength training. The video includes rigorous and branching exercise routines in multiple difficulty levels. If you have it, you can choose your workout from Weight Loss, Strength Training, Intervals and Hill Climb. You can set the intensity of the exercise routine from light, medium and hard. You can also choose from 5, 10, 15, 30, 45 or 60 minutes workout. I actually tried the running obstacle courses and balance beam for 5 minutes. This video has also the hand car, rowing/paddling, crossing monkey bars, punching bags and many more. It has 3 levels of difficulty that requires more motion and a harder workout. The Jillian Michael’s Fitness Ultimatum 2009 is pretty cool and I like it. I already customize my character and already input my personal data to measure my progress via the Statistics screen: calories burned, weight, in game performance and more. Well, looking forward for my workout and hoping it will be successful before the year ends. If you have a Wii game, buy this fitness game. My husband and I attended a beautiful wedding last Sunday which was held by the lake in the innermost area in Missouri. After the ceremony, the wedding entourage took their pictures outdoor while the guests were guided to the beautiful reception area down the basement of a restaurant. The guests started nibbling the fruits, salads and cheeses but some were already digging on the delicious lasagna with Ricotta Cheese. I am not a big fan of cheese but, for the first time I ate a full plate of variety of cheeses. It was so good especially when I ate the grapes and strawberries with it. They served variety of food and everyone really enjoyed the delicious foodies on the table. The lasagna was so creamy and one of the most favorite menu that day. Did you know that ricotta is a favorite component of many Italian desserts? I assumed that most of us love Italian food right? Ricotta Cheese is a good ingredient in making cheesecakes, cannoli, and some cookies. 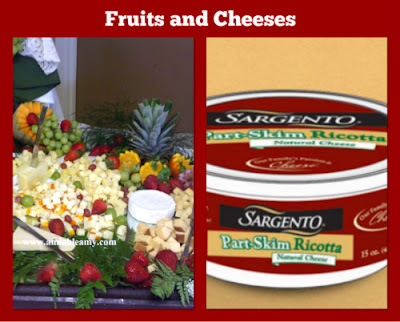 But, Ricotta Cheese is commonly used in savory dishes and that includes pasta, calzone, pizza, manicotti, lasagna, and ravioli. If in case you have no mayonnaise, Ricotta Cheese is a suitable substitute in any traditional egg or tuna salad as well as a sauce thickener. Anyway, since they have Hawaiian guests, they also have steamed rice and kalua. We left after the slicing of the cake since we had to head back to another town to catch our flight. All I could think of was the awesome view by the lake, the beautiful ceremony, and the great food they served which are aplenty. All the guests are dear friends and close knit family of the bride and groom. Walt Disney World which is located in Florida has 4 theme parks namely: Hollywood Studios, Animal Kingdom, Epcot and Magic Kingdom. Each park is enchanting and full of fairy tales with amazing entertainment, beautiful attractions, and full of adorable shops. Disney Characters will be seen anywhere in the park and most of all; the building designs and structures at Disney are truly extra ordinary. In Magic Kingdom, the iconic Cinderella Castle is located in the middle of the park. It has pathways across the 107 acres surrounding by what they described as whimsical lands: (photo above) Main Street, U.S.A., Adventureland, Frontierland, Liberty Square, New Fantasyland and Tomorrowland. I was thinking, the minds of Walt Disney was truly amazing to fantasized all these places and make it into reality. But, wait... check this out! I am in Marceline, Missouri this week and I took all these photos. This is the Main Street USA in Marceline, Missouri, the boyhood town of Walt Disney. It is very similar in the Main Street USA in Magic Kingdom. It has little shops, the Imporium is there, and the Movie Theater as well. The street sign says "Main Street USA" with mickey mouse ears in it and take note of the clock here. It is all over in Magic Kingdom too. Check out the clock in the first photo above. Did you know that Main Street USA was inspired by Walt Disney's hometown in Marceline, Missouri? Now you know. For few months of staying at home doing nothing, boredom took over me. I got plenty of time doing things that is not productive. Are you at home all the time? What do you do to keep your time productive? Well, if you need motivation, I can suggest one which I just knew few weeks ago. A good motivation that will bring rewards at the end is what I am talking about. When you have extra time, enhance your skills and knowledge in IT by enrolling in online classes. You can get that IT Certification or Office Skills and widen your knowledge in Microsoft Office, Adobe CS, Management, Computer Concepts and Web Coding. There is no long term commitment and you can always choose the option to pay by the month or annually. It is only $25 a month so; it is really affordable. You will have unlimited access to LIVE Web Classes as well as the OnDemand Training. You can train when you want at the comfort of your home or office. The affordable fee that they charge is very affordable. You should sign up for Office Membership, you will have unlimited access to all Instructor Led Online Ondemand Office Classes as well as Live Web Classes. You will also gain practical knowledge and will have access to LearningGate Career Center Job Postings. There are new WebClasses and OnDemand classes which will be added regularly to the membership so; learning is truly endless. Social media is also offered and integrated such Facebook and twitter. If you need more IT training, you can enroll in Technical Membership. They offer Ondemand classes such as CompTIA, Cisco Authorized Training, VMware Training, MCITP, MCPD, MCTS, MCSE and many more. You should check out this Website today. Visit http://www.learninggate.com/?page=go today and decide which membership is right for you. Are you looking for a Neurologist? If one member of your family suffers a disorder such as Adult epilepsy, pediatric, neuromuscular, and neuro-opthamology, please visit the link provided below and seek for medical treatment. Just few days ago, I saw a picture of a little girl in one of the social media accounts that I have. The baby was so sick and my heart broke seeing her with no hair at all. The mother embraced her while she lay in bed in the hospital. She has a brain tumor and the chance of getting better is slim. I just can’t imagine how the family managed through the ordeal of having to see their baby so sick. The parents have to rely on the expertise of the Pediatric neurologists and neurosurgeons. After all, their medical specialty is concerned with the prevention, diagnosis, treatment, and rehabilitation of disorders in the brain, spinal cord, peripheral nerves. When a child has epilepsy, migraines, strokes, brain tumors, ADD/ADHD and, hydrocephalus, parents should look for pediatric neurology in the area. If you live nearby Beth Israel Medical Center, they have the Department of Neurology which is the leader in the treatment of brain disorders and diseases of the nervous system. For more information, you can check out the Website today. God bless you and keep it strong always. As I was flipping the folders of my pictures, I saw this photo. This is the Christmas tree of the late Sandy, my father-in-law. 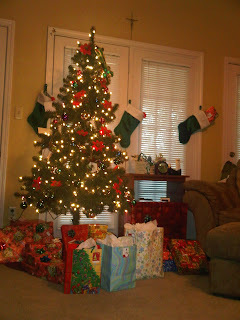 I wrapped all those gifts for the family. My husband and I misses him every day especially at Christmas time. This year, we will miss him even more. Rest in peace Dad. We love you. Splurging a space in your home is a good idea. Would you prefer your kitchen? Bathroom? Or, Living Room perhaps? For whatever reasons you may have, just go for it! 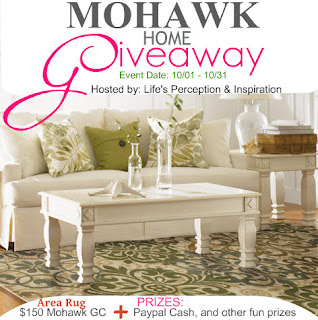 For accessories and decor, this giveaway might be a good opportunity to join for a chance to win an area rug, making your space more cozy and elegant. Welcome to $150 GC & Mixed Bag Giveaway hosted by Life’s Perception & Inspiration. How would you like win some cash and other cool prizes? Click HERE to view the PRIZES. Giveaway will run October 1st @ 12:01 am EST until October 31st @ 11:59 PM EST. All entries will be verified. This opportunity is open worldwide except for the $150 GC from Mohawk. So what are you waiting for? This blog is not responsible for shipment of prize. Would you like to own a Himalayan Salt Crystal Lamp for FREE? Join the Giveaway today. Just Follow or Like the Facebook Pages and Twitter Accounts or Comment on this post using the form below and your entry is all set to go. 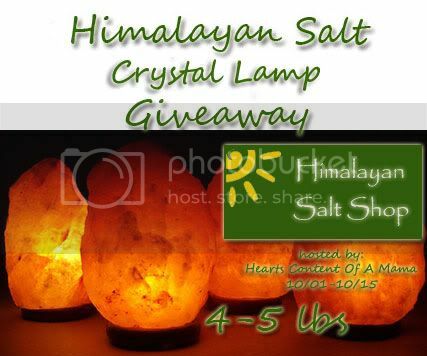 About the prize: One very lucky winner will get a Himalayan Salt Crystal Lamp (4-5 lbs). Giveaway will run until October 15th at 12:01 am EST, must be 18 years or older to enter. To enter, just fill up the rafflecopter form below. AMIABLEAMY.COM is not responsible for sponsor prize shipping. Thank you for participating everyone and Good Luck! Many "Thanks" to the lovely bloggers who are helping me to promote this giveaway!